Mortland Door Systems we install the best and service the rest! At Mortland Door Systems, it is our pleasure to take care of all of your garage door needs. Whether you are looking for a residential, commercial or industrial garage door, our team can help you choose the best overhead door system to meet your needs. 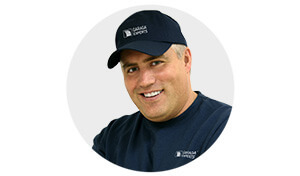 Because our customers deserve only the best, we carry the top garage doors brand: Garaga! With Garaga garage doors, our customers get more than they expect for their money in terms of quality and dependability. With over a hundred different models, this collection meets any customer’s needs. You are ensured of finding the garage door to go perfectly with your home design. See our complete range of doors in our image gallery section. Visiting our showroom is another way to experience our top quality products. Or you can complete our quotation form on line or even just call us. From selection through your garage door installation, will be pleased to guide you. Your garage door is, believe it or not, the biggest moving object in your home. To get a safe garage door system, your door opener has to work well day after day. Our professional technicians can give you expert advice so you make the right choice. At DSI, we only sell and recommend the best, longest‑lasting garage door opener, LiftMaster. The manufacturer, The Chamberlain Group, is known for producing the most powerful motors in their category while also making safety a priority. They use only superior components to design and build the safest door openers. This line of openers is available for residential, commercial or industrial use. Visit our door opener section to see our whole collection and learn more about their features. To get the best performing garage door system, a properly done installation is critical. At DSI, we are a certified of Garaga Expert. This certification guarantees you receive services that meet the highest safety standards provided by rigorously trained technicians. Does your current door system need any repairs? If it does, go ahead and give us a call. Our knowledgeable technicians will easily get your garage door back on the right track. We also provide 24/7 emergency service plus a full range of maintenance programs. Get in touch now with one of our experts by scheduling a service call online or simply call us at 781-826-2212. We proudly cover a wide portion of Plymouth County and areas of Norfolk County. We look forward to serving you! Norfolk County: Braintree, Brookline, Canton, Dedham, Dorchester, Dover, Foxborough, Holbrook, Hyde Park, Milton, Needham, Norfolk, Norwood, Plainville, Quincy, Randolph, Roxbury, Sharon, Stoughton, Walpole, West Roxbury, Westwood, Weymouth, Wrentham. Plymouth County: Abington, Brockton, Carver, Cohasset, Duxbury, Hanover, Hanson, Hingham, Hull, Kingston, Marshfield, Norwell, Pembroke, Plymouth, Plympton, Rockland, Scituate.